The most charismatic sprinter of all time, Mario Cipollini, was a guest of honour last night at the Tour of California presentation dinner just hours before he hits the road in the race itself. 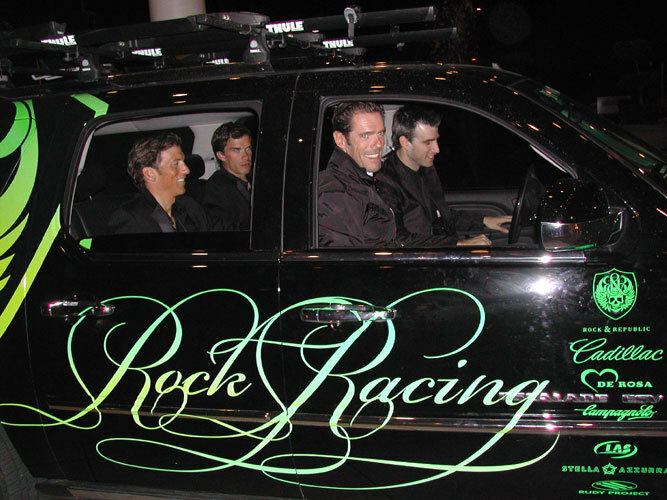 Photographed in a team car of his Rock and Republic squad on Friday evening, Cipollini looked fit and on form, even if presumably he was tired from the long air trip from Europe. As usual with Cipollini the questions of whether he would finally take part in his first race since Milan-San Remo 2005 have been surrounded by uncertainty, last-minute changes of heart and all the other issues that help make the man a walking, talking soap opera. His contract was only signed this week, he has backtracked on more than one occasion and the team itself has added to the controversy by signing Tyler Hamilton, Santiago Botero and Oscar Sevilla ? all three implicated in the recently re-opened Operación Puerto anti-doping probe. Despite strong rumours to the contrary, Hamilton ? seen here in the picture next to Cipo? – has confirmed to Cycling Weekly?s Stephen Farrand that he will be taking part in the Tour of California alongside Cipollini. After all the razzmatazz about Cipollini?s participation, it remains to be seen whether in fact all the fuss has been worth it, and Cipollini can do more than finish somewhere in the back of the pack on each stage.